Insulin Pump Therapy or CSII (Continuous Subcutaneous Insulin Infusion) is a treatment option for people with Type 1 diabetes which replaces the need for daily injections. Insulin is controlled by a small device (a pump) about the size of a pager, which can be hidden discreetly or clipped to your clothing. Insulin is delivered from the reservoir in the pump though thin soft tubing to a Teflon cannula which is inserted under the skin, normally somewhere on your abdomen. This cannula is replaced every 2 or 3 days. 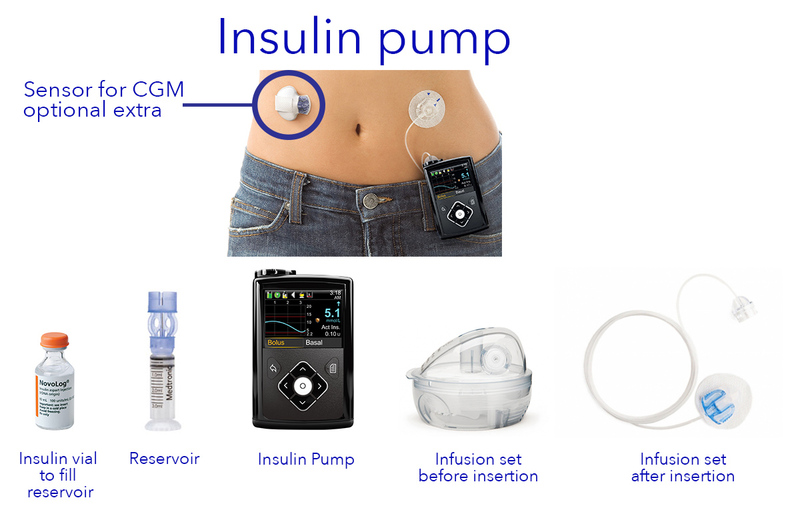 Insulin Pumps operate with fast-acting insulin only and can be easily disconnected by the clip for up to 1 hour for sport etc. A pump does not monitor your blood glucose, this is available as an add on Continuous Glucose Monitor for people on pumps or injections. The user or carer programs the pump to release variable amounts of basal (background) insulin dependent on your personal needs. Bolus doses are given with food. Carbohydrate counting and frequent blood glucose monitoring are necessary to operate Pump Therapy safely and effectively. A pump is the closest substitute available to your body making and delivering its own insulin. New smaller devices e.g patch or nano pumps are in development. With work, a pump can enable you to have tighter control over your blood glucose levels, most people will experience less swings and a reduction in their HbA1c after commencing pump therapy which also reduces the likelihood of future diabetic complications. New pumps e.g. Medtronic’s 640G is being sold as a system in some areas in England, which means it is provided with a Continuous Glucose Monitor (CGM) as part of the package. This enables the user to have full use of all the functions in the pump, in Scotland this is normally an optional extra which you can self fund if you choose to do so. As CGM technology advances it is becoming more common in the US and other top diabetes centres around the world. A Continuous Glucose Monitor will monitor your glucose levels 24/7 and therefore fill in the blanks between finger prick testing. The new Dexcom G5® is the first CGM to receive approval to allow treatment decisions without confirmation from finger prick tests. However calibration with 2 finger prick tests are still required per day. Other monitoring devices are available for example The Abbott Freestyle Libre which does not alert highs and lows but is similar to sensor technology, glucose readings are taken by swiping a reader over the sensor. This is a great option for self funders as there is a much smaller outlay and is a very useful device. New types of sensors will be available in the future.